One of the best things about travelling by rail across Europe is that you often find and stop off in places you would never have experienced otherwise. Veliko Tarnovo is a prime example of that for me. My original reason for visiting the city was simply to break up the journey between Bucharest (Romania) and Istanbul (Turkey). It is therefore by sheer accident that I discovered what I believe may possibly be Bulgaria’s most beautiful city. I can’t believe I almost missed out on visiting this city as it turned out to be my favourite place in Bulgaria (so far) that I have visited. Veliko Tarnovo is a small city situated up in the hills. The old town is built into the curve of the mountain, and if you make your way down to the Assens Monument you’ll find incredible views of the town up on the hill surrounding you in a U shape. I remember the drive to my hostel from the train station when I arrived just as the sun was setting. There were road works in town so we went the back roads which gave us sweeping views of mountains and valley. I immediately fell in love with the place and the view. 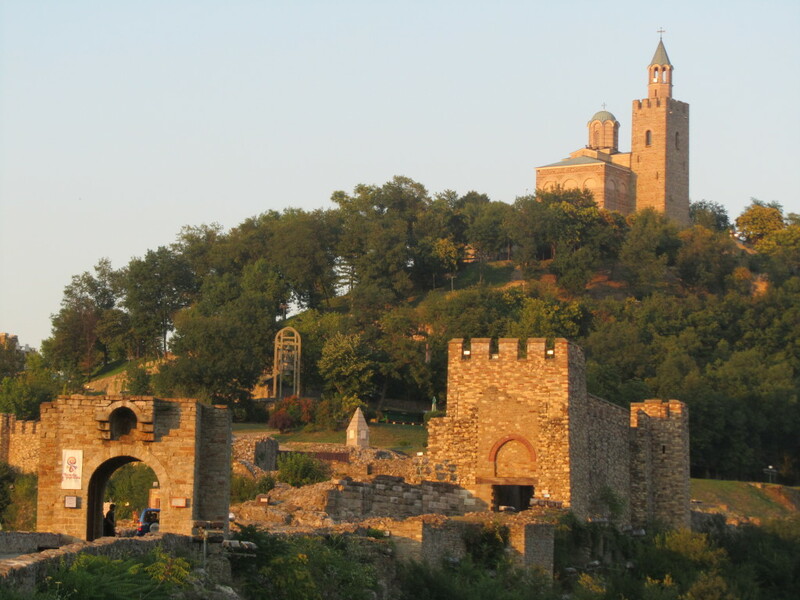 The main tourist attraction in Veliko Tarnovo is Tsarevets Fortress. Perched up on top of the hill of the same name, the fortress once served as the main medieval stronghold during the Second Bulgarian Empire. The main reason why you may want to check out Tsarevets Fortress (other than for its historical importance of course) is simply for the views. Walk around the fortress grounds and you’ll find aerial views of the surrounding town and countryside from every angle. The entrance fee is also quite cheap at just 6 BGB (£2.64 / €3.07 / $4.11) to enter. 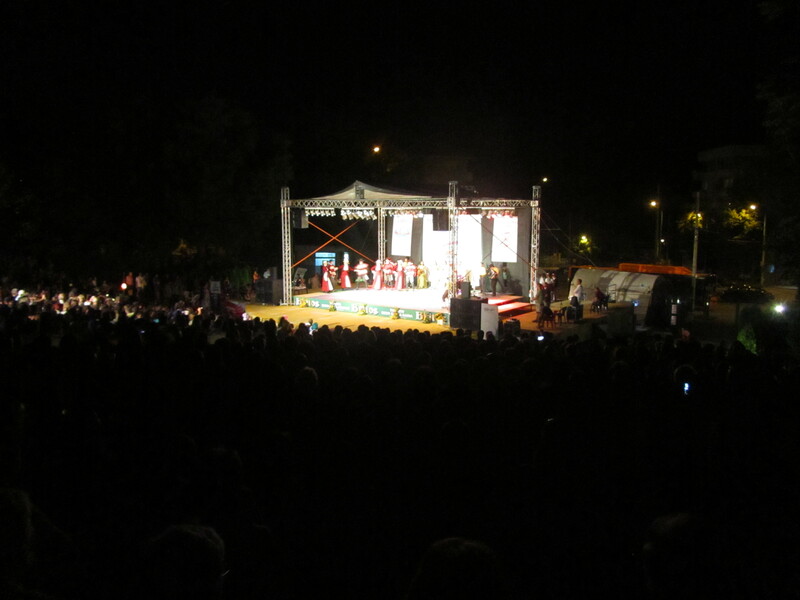 I happened to arrive in Veliko Tarnovo during the end of the International Folklore Festival this year. Its main aims are to present the folklore traditions of countries from around the world and to promote Bulgarian music, dance, and arts from all regions. The festival is free (which is great for budget travellers who happen to be passing through). One of the most endearing factors about it was also seeing how involved the local people of Veliko Tarnovo got. On the night that I went down to the main stage a variety of acts took to the stage to present their local music and dances. These included countries such as Brazil, the Netherlands, Chile, and of course Bulgaria. The local people in the crowd really seemed to get involved with every dance – clapping, cheering, whooping, singing, and dancing. It was nice to see the local people in Veliko Tarnovo welcome such cultural diversity, and in a way it really made me love them. If you want to see the festival for yourself it usually takes place from 19th July to 2nd August each year. Unfortunately the folklore fest website isn’t the most up to date (it’s still announcing 2008’s festival). I therefore recommend that if you need the most up to date info in regards to when exactly the festival is on, your best bet is to ask your hotel or hostel reception when you arrive! This is how I found out about it in the first place! Hostel Mostel is a hostel chain in Bulgaria who I previously stayed with in Sofia and also in the city of Plovdiv. I already knew they were pretty awesome – hence why I wanted to stay with them again – but their Veliko Tarnovo hostel was even better than I had expected! Just like in all Hostel Mostel properties you get a free hostel breakfast AND dinner + beer every day of your stay. The staff were also super friendly and helpful, and the train station pick up helped greatly. The main reason why I loved their Veliko Tarnovo hostel especially though was because of the common room and garden areas. They have chill out areas to rival any hostel I’ve every stayed at (and I’ve stayed in around 200+ now). For me it was the perfect place to chill out after a hectic few days in Bucharest and some arduous train journeys. They also happen to be just 2 minutes walk from the Tsarevets Fortress, which as I mentioned above is the main attraction of the town. I really loved this hostel. 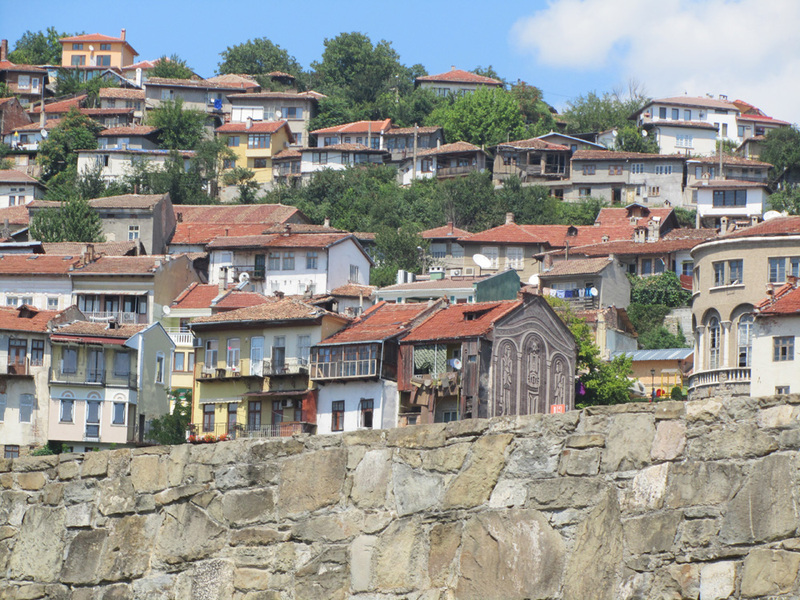 – Veliko Tarnovo for me was a real surprise and made me yearn to see more of Bulgaria’s countryside. I saw a lot of people booking here like I did simply to break up a journey. At the end of it we were all left feeling thankful that we’d stopped and found this beautiful historic city. There’s not a huge amount to do here other than chill out and just take in the scenery, but in a way that’s sort of what I needed after about of a month of chopping and changing destinations every day in what would often be big cities. It was actually just nice to sit in this beautiful setting and take it all in. – If you liked this article you may also want to read my first impressions of Varna, Bulgaria. Great post Jane! I must visit Veliko Tarnovo now!